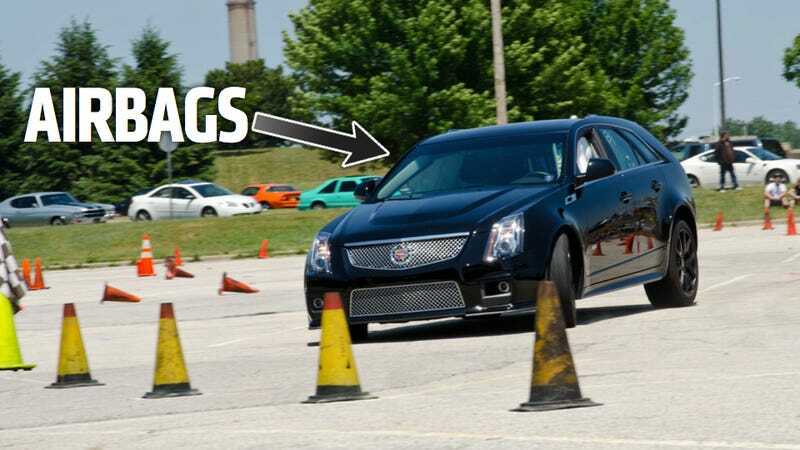 GM Engineer Brad Doerr's fiancée Holly would normally be out on the track with him and their Cadillac CTS-V Sport Wagon for a day of auto-crossing, but she was a little busy getting primped for the wedding they'd planned just two hours later. So there he was, alone, out on a fairly tame course when all of a sudden his seatbelt tightened and he heard a bang. The airbags had exploded even though there was no collision of any kind. How was he going to explain that to his future wife? Brad and Holly planned the kind of wedding and honeymoon fitting for a pair of serious gear heads. They'd be participating in the Hot Rod Power Tour and take a break in Muskegon for the wedding before taking the Cadillac over to Champaign, Illinois and all the way down to Arlington, Texas. Doerr was enjoying a pre-wedding autocross lap (how cool does that sound?) and hitting around 0.92 g's of lateral acceleration when the airbags went off. "I hear a bang," Doerr explains, "[and] thought I'd gotten hit by a truck in the door, but I look out and there's a side curtain airbag." Slightly perturbed that his car had reacted that way, he was less than pleased when the OnStar representative called asking to send a tow truck, assuming he'd been in a fender-bender. Words were exchanged between the testy groom and the OnStar, but Doerr says he was just understandably freaking out a bit. "I wasn't displeased with OnStar, I was just displeased that my airbags had just gone off. OnStar just happened to be the immediate scapegoat by calling me," he explains. And how did he tell Holly? Smartly, he didn't, although a post on Facebook led to one of her friends showing her the image. As of yesterday he was worried that he wouldn't be able to make it through the rest of the Honeymoon without a car, but a local Cadillac dealer in Muskegon was nice enough to give him a loaner for the rest of the Power Tour (a not-quite-as-powerful Impala) while they try to repair the CTS-V (and try to figure out why this happened). Despite all the pre-wedding drama — and there's always some — the nuptials went off without a hitch. Or an explosion.